Behavior Analytics Market size was estimated to be over USD 200 million in 2016 and is forecast to grow with over 40% CAGR. Increasing number of insider attacks in the organizations across the globe is anticipated to drive the demand for behavior analytics market across the globe. As security threats increase, it gives rise to the requirement of an advanced security solution to identify malicious activities and vulnerabilities. Lack of awareness about advanced cyber security attacks among organizations, especially SMBs, is hindering the growth of the behavior analytics market. SMBs across the globe rely on cyber insurance to mitigate cyber threats due to lack of knowledge about the analytics technologies, restricting the industry growth. Furthermore, the overly complex processes in any organization using several tools from different vendors makes it complex for the security teams to get the proper visibility of the user activities. Industry players are working on developing solutions and apps that can minimize the manual efforts of analyzing user behavior. For instance, IBM delivers the capability with an app on the App exchange by integrating UBA into its SIEM platform. It does not require an analyst to learn a new tool, thus speeds up the entire process. On premise deployment model accounts for major share in the behavior analytics market owing to the low risk of security breaches and cyber-attacks as compared to the cloud-based products. As the solution integrate data from various sources, which organizations do not want to import to cloud platforms that contain very confidential and sensitive data. The demand for cloud-based products are estimated to increase in the future owing to the cost effectiveness and constant advancement to enhance security of the cloud platforms. Insider threat detection solutions are estimated to account for major share in the behavior analytics market owing to the rising incidences of the insider attacks across the globe. Threat of insider attacks among organizations is prevailing from more than a decade. A survey organized by Hystax Technology, a security solution provider, coving more than 500 security organizations stats that more than 70% of the organizations are exposed to the risk of insider attacks. As insider threat detection solutions utilize advanced analytics technique to effectively detect and alleviate impact of insider attacks, therefore it is estimated to drive the demand of insider threat detection solutions. BFSI applications are estimated to be one of the leading end-user in the behavior analytics market owing to the high risk of cybersecurity. The banks and insurance companies are more exposed to the risk of cyber-attacks as they hold very confidential data and any incidences of data breach directly leads to financial losses. Furthermore, increasing investment of financial institute towards information security is also estimated to be one of the major factor that is augmenting the demand of these solutions among BFSI industry sector. Technological advancement in the security solution such as integration of advanced analytics and machine learning algorithms is also contributing to the industry growth. In addition, growing adoption across applications such as healthcare, BFSI, and IT & telecom owing to the increasing incidences of data breaches and rising demand of real time security analytics to detect threats in advance and mitigate their impact will further drive the behavior analytics market demand. U.S. behavior analytics market dominates the global landscape owing to the presence of major players such as Splunk Inc., IBM Corporation. Furthermore, high internet penetration rate and large number of mobile phone and application users in the country are also estimated to contribute significantly towards the industry growth in the region. In addition, rising adoption in the healthcare sector in the U.S. due to increasing healthcare IT infrastructure and growing number of data breaches will contribute to the industry growth. According to IBM cyber security index, approximately 60% of the cyber-attacks occurred in U.S. are carried out by insiders, wherein the employee exploits its rights to access privileged and confidential company database or violate internal information security rules and regulations. 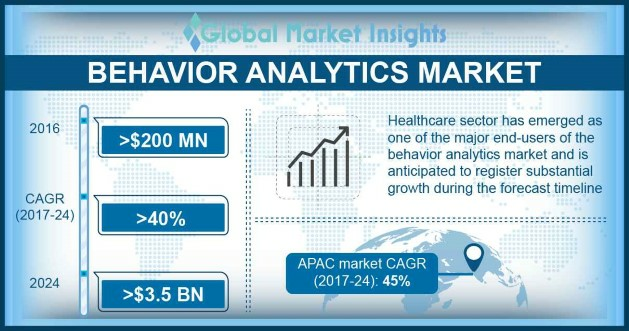 Companies operating in the behavior analytics market IBM Corporation, Splunk Inc., HP Enterprises, Dtex Systems, LogRhythm, Rapid7 Balabit Corp, Bay Dynamics, Bottomline Technology, Cynet Security Ltd., E8 Securtiy, Exabeam, Fortscale, Gurucul, McAfee, Interset and so on. The market players adopt various marketing strategies such as mergers and acquisitions, strategic alliance, new product launch, and geographical expansion to get edge over competitors. For instance; in August 2016, Splunk inc. announced that it has joined with Accenture, Palo Alto Networks and Tanium to develop advanced managed cyber defense solutions that easily identify, detect, prevent and responds to advance cyber-attacks. The behavior analytics market is driven by the growing adoption of the big data platforms such as Hadoop among organizations. The increasing adoption of the big data platform increases the data traffic, which give rise to the data breaches incidents and threat of insider attacks. Besides that, increasing usage of internet services, growing adoption of mobile phones and mobile application across the globe also estimated to have significant impact on the growth of the market.